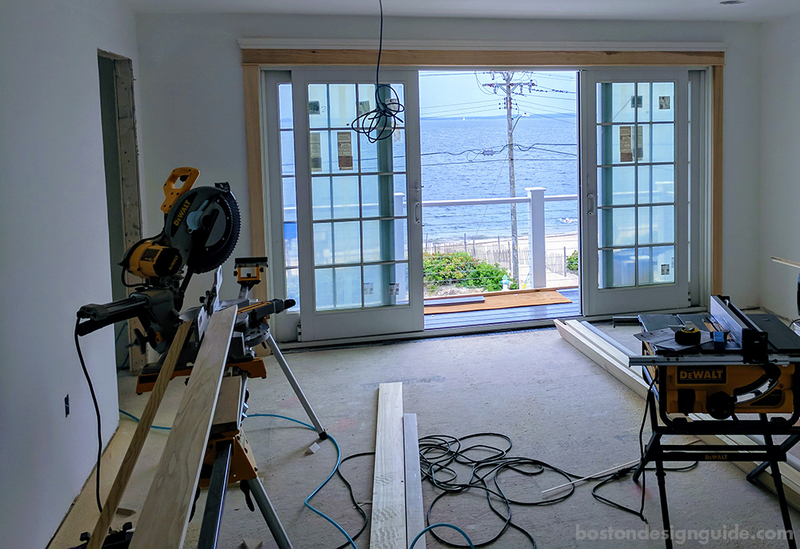 We’re not sure there’s anything more exciting than watching your summer home take shape, which is why we were pleased that Longfellow Design Build shared its progress on a complete teardown and rebuild on Falmouth’s Surf Drive. 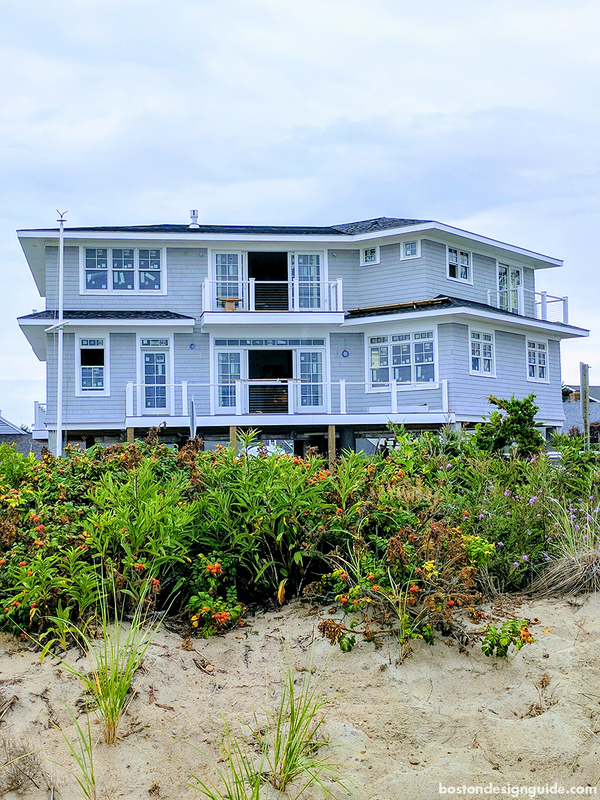 The property is slated for completion in late 2017, and located directly across from Surf Drive Beach, overlooking the vast blue expanse of Vineyard Sound. While its coveted coastal locale means that the residents can spy nearby Nobska Light and Martha’s Vineyard in the distance from its many balconies and windows—“all rooms provide multiple clear sightlines to the ocean,” says Longfellow Design Build Marketing Director Mark Ciolino—it also means that the home sits within a designated FEMA Flood Hazard area. Sadly, all too recently we’ve been reminded of the devastation that can come from high winds and flooding from storm surges, so to reduce the risk (as well as flood insurance costs), the client opted for a raised pier and beam foundation common for homes built in areas prone to earthquakes and hurricane strength winds. 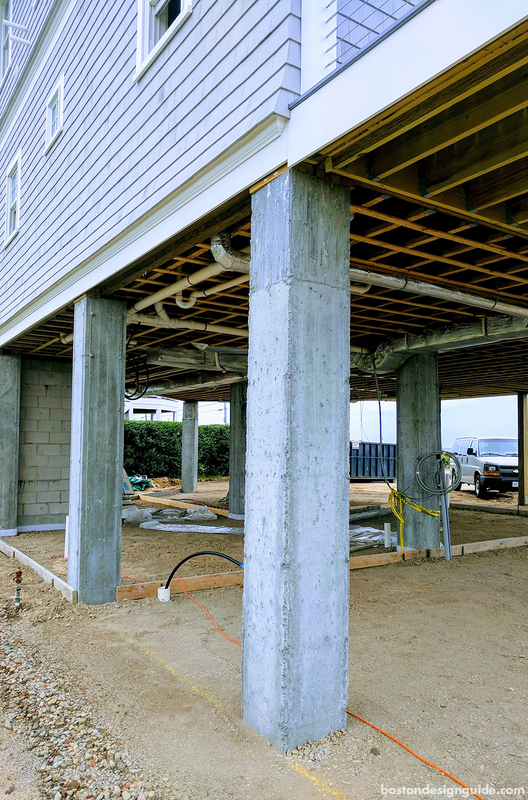 The pier and beam construction features concrete piers set deep into the ground that bear the weight of the home, explains the builder, with an elevated foundation in lieu of sitting directly on the ground. Utility units, including electricals and plumbing, are then installed within a crawlspace, making the structure less vulnerable to damage. Because of the getaway’s exposure to the elements, a strict code of materials was followed to guard against the corrosive effects of the salt air, steady winds, harsh ultraviolet rays, as well as the mold and decay that can stem from the humidity in the environment. 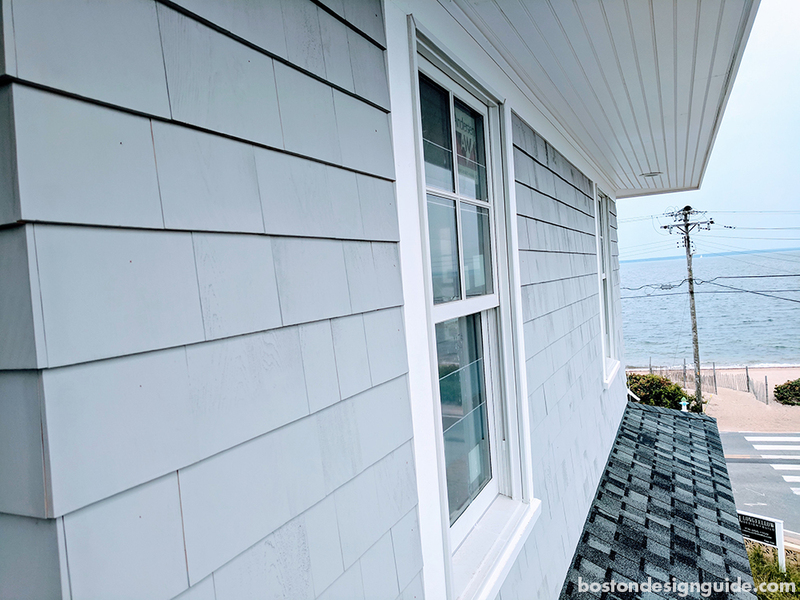 To this end, the contractor used double-coated pre-stained shingles that are water repellant, mildew resistant and offer UV protection. 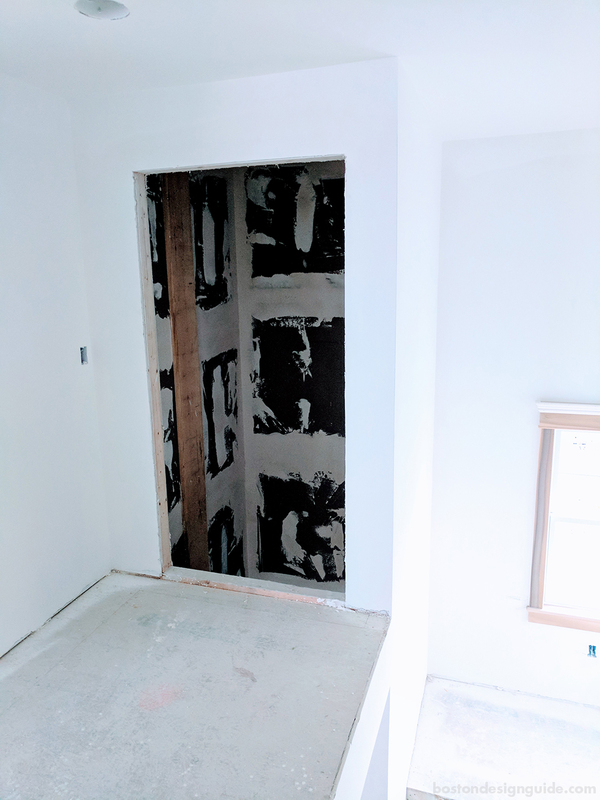 They also integrated vinyl windows, composite decking and “a new structural wall panel system with a built-in energy-efficient barrier that keeps moisture out and reduces air leakage that can cause moisture damage within your walls,” says Ciolino. 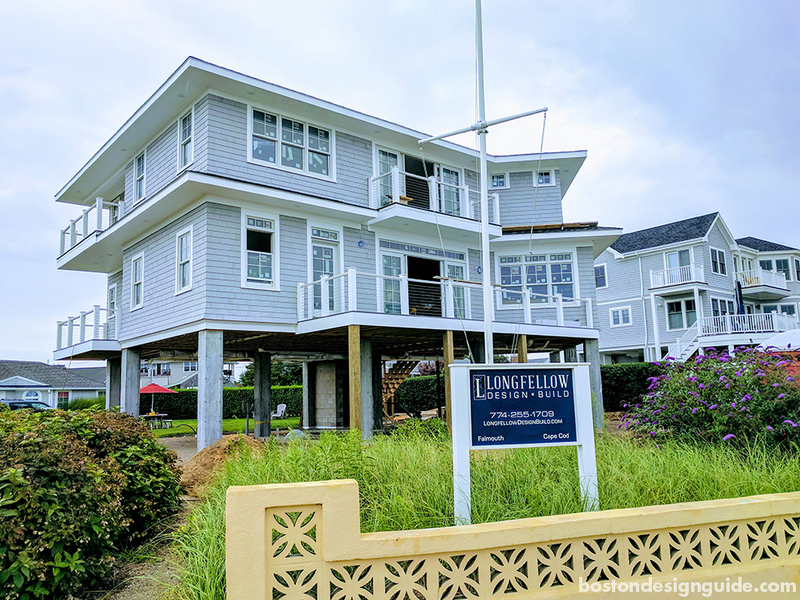 The home’s gorgeous locale made for a long list of flood zone build requirements, but Longfellow Design Build is negotiating the criteria with care. Come next summer the owners will be able to fully enjoy their place in the sun, and have peace of mind in the years to follow.